Introduced in 1986, a Two-stroke motorcycle design to compete with similar two-stroke 100 cc motorcycles. Honda was losing ground in 100 cc class bikes as their Four-stroke bikes like S110 and later CG 125 proved to be too slow compared to other Japanese bike manufactures bikes (specially Kawasaki) with their quicker and sleeker Two stroke bikes. This bike was an upgrade for Honda MB 100. 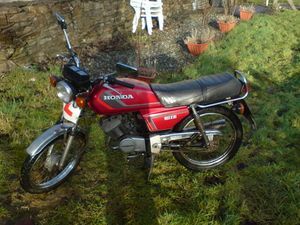 It had good styling and could reach 100 km/h (62 mph) in 12 s which was good for a 100 cc bike at that time. Small ends, connecting rod had problems, motor also didn't last long, pistons were the first to go and gave in very quickly. Production was discontinued 2 years later as stricter emission levels made 2 stroke bikes redundant. This page was last edited on 23 November 2010, at 21:42.